Smells perfect and leaves my hair hydrated and bouncy! Smells like heaven and leaves my hair bouncy and full of body. I had been using this shampoo for a couple of months on my highlighted hair and liked the clean and shine that it produced. However, it wasn’t until after my global bleach did I realize just how superior this shampoo is. All of the aftercare shampoos/conditioners recommended by my hair stylist weighed my hair down and my hair became coarse and dry no matter how moisturizing the product claimed to be. Once I started using this shampoo again, life came back to my hair! ISoft and shiny hair! I trust LG and won’t ever be swayed again! Smells soooo good! The shampoo has a great, very thick consistency, and you don’t need much to wash your hair. Leaves hair bouncy and wavy – I love everything about it. My hair gets prettier with every use of any LG product. I’m a 52 year old female with fine, fragile, highlighted, colored, thinning hair. Chemotherapy caused only minor hair loss and gave my fine, straight as a board hair lovely waves and curls. Quite unexpected! 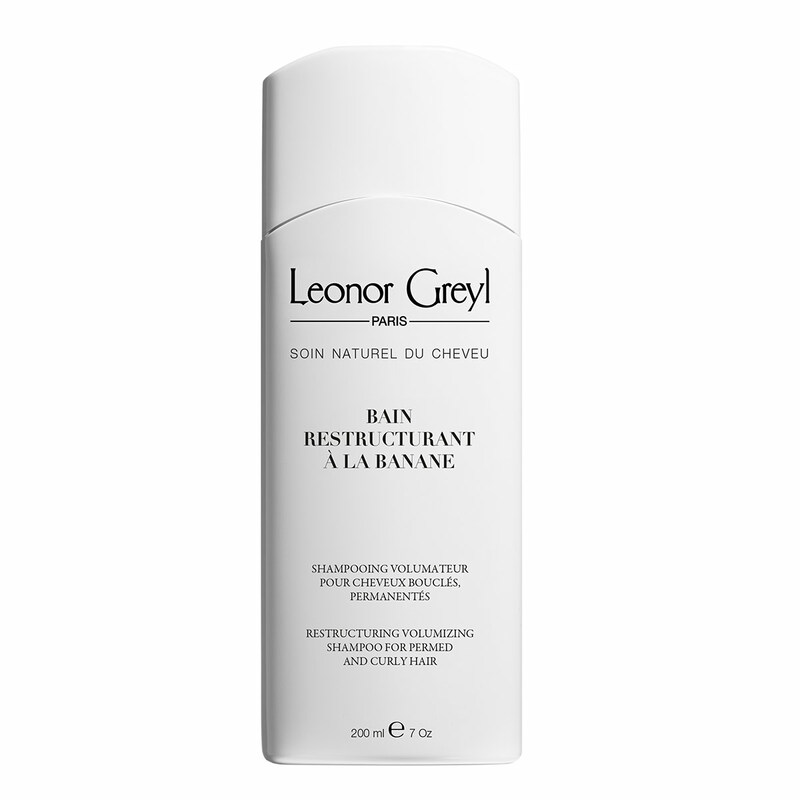 Bain Restructurant a la Banane is my favorite LG shampoo – it gently cleanses and hydrates scalp and hair without making scalp oily or weighing down waves and curls. I alternate between several LG condition and treatment masks, and apply Huile de Leonor Greyl overnight once a week. Since the products are made with exceptional and concentrated ingredients, a little goes a long way. Thank you to the Leonor Greyl team of experts for creating/ formulating such lovely, non toxic products that actually perform as described! Love this shampoo! Have oily SCALP but fine, fragile colored, dry HAIR. SHAMPOO cleans gently yet thoroughly, leaves hair shiny, has faint banana scent. I do use prior LG or Beauty OIL treatment and CONDITIONING, Masque Regeneratice. Since one needs tine amounts, they last. ORDER THE SAMPLE SET/FREE POSTAGE, and try out which products work BEST for YOU. SHAMPOO cleans gently yet thoroughly, leaves hair shiny, has faint banana scent. I do use prior LG or Beauty OIL treatment and CONDITIONING, Masque Regenerative. Since one needs tine amounts, they last. Created in 1982, Bain Restructurant was the first shampoo to address the problems of permed hair. A huge trend at the time, perm damaged hair was difficult to care for at home. Jean-Marie Greyl looked into a solution to gently cleanse hair while protecting bounce and curl. The answer was banana sap to create definition and shape, which he paired with plant proteins to protect and strengthen hair. Since then, Bain Restructurant has become a true favorite for curly hair lacking in softness and tone.